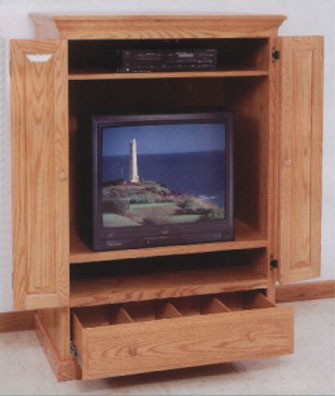 Our bi-fold TV console is nearly identical to our classic TV console, with a few less “bells & whistles” to save you money. The exterior measurements are almost the same, but we replace the pocket doors with a pair of bi-fold raised panel doors, the TV swivel at the bottom with a fixed shelf, and the VCR box at the top with an adjustable shelf. The drawer on the bottom is the same size. The net result is that you save some money and you gain a little bit of extra storage space on the inside.